A firearm muzzle brake kit can be one of your most essential firearm accessories. At Infinite Product Solutions, we have a wide range of gun muzzle brakes to suit all types of firearms and needs. Here you’ll find all of our most comprehensive firearm muzzle brake kits; these are multi-accessory bundles designed to connect all of your essential firearm components. When you order one of these sets, you not only get the best muzzle brake for the value, but you also get an array of other accessories that every gun owner should have at their disposal. When you order an ultimate firearm muzzle brake kit from Infinite Product Solutions, you save money. While we all know that a gun muzzle brake provides a simple and cost-effective means of combating recoil and improving your control, these muzzle brake kits provide so many more benefits. With these bundled barrel thread adapters and muzzle brakes, you’ll also be able to connect oil filters, fuel filters, Mag Lite adapters, bottle adapters, and other firearm solvent traps. Enhance your firearm while also equipping yourself with high-quality gun cleaning essentials. Some of our larger firearm muzzle brake kits are especially useful for enthusiasts with multiple firearms. By having access to barrel thread adapters of multiple thread sizes, you’ll never have trouble finding the appropriate connection right when you need it. Each carefully assembled firearm muzzle brake kit in our inventory is unique, so be sure to check out each option and review the complete list of accessories included with each order. We have included all of the necessary specs and measurements so you can find exactly what you’re looking for. Be sure also to refer to our Thread Reference Guide, and contact us if anything is unclear, or you can’t find precisely the bundle you’re looking for. Our firearm muzzle brake kit includes accessories that are extremely easy to install and use. They attach directly to the threaded barrel of your firearm. As long as your thread size lines up, you can attach these muzzle brakes and barrel thread adapters in a matter of seconds. Once your thread adapter is attached, you can take the next step and attach a corresponding firearm solvent trap for easy cleaning. We have oil filters, fuel filters, and other solvent traps right here in our inventory if you’re looking to secure all the parts you’ll need. 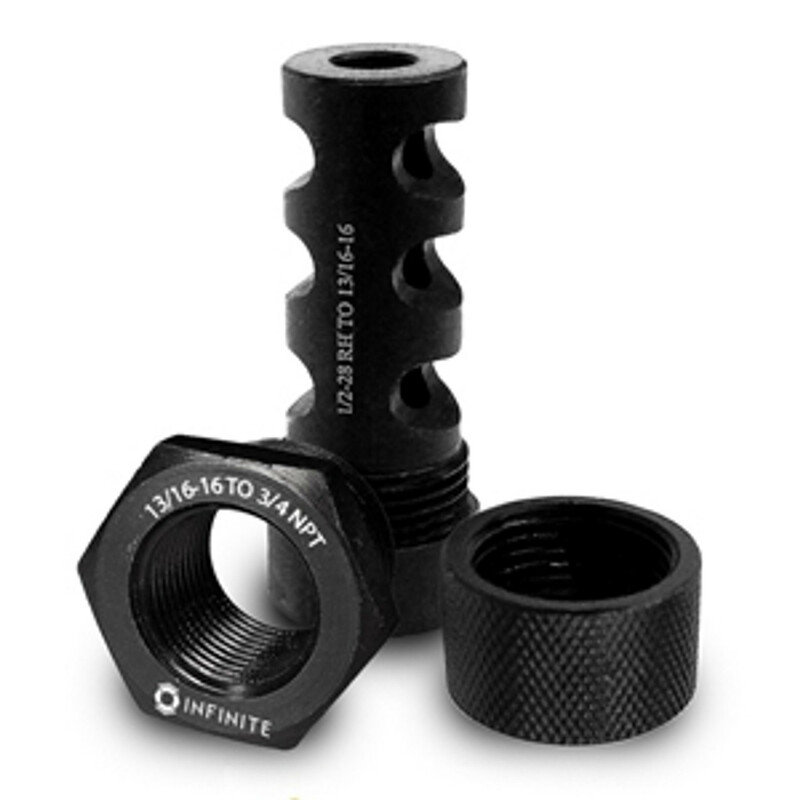 At Infinite Product Solutions, we manufacture barrel thread adapters and muzzle brake products made from the best materials. Each model is rigorously tested for safety and quality, and each is designed using the toughest materials like black oxidized steel. Most importantly, we’re all committed firearm owners ourselves, and we’ll only sell products that adhere to our uncompromising standards. When you’re looking for the best muzzle brake kit on the market, look no further than Infinite Product Solutions. Order yours today, and experience the difference in quality and value. You can view all of our muzzle brake products in our online catalog. Along with premium muzzle brakes and firearm muzzle brake kits, Infinite Product Solutions has been manufacturing and selling gun cleaning kits and barrel thread adapters for nearly a decade. We also take custom orders and ship to customers across North America. To learn more about our company, which is based out of Corona, California, or if you still have any questions, please send us an email, fill out our online contact us form, or call our experts at 1-951-220-7948.